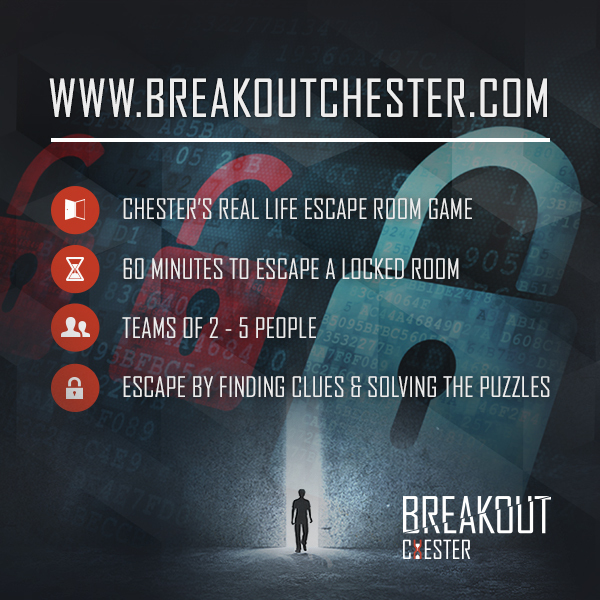 We are Breakout Chester, we are a live room escape game situated in the heart of Chester. We challenge members of the public to be locked in one of our puzzle rooms for 60 minutes while they attempt to escape. With the clock ticking down rapidly the challengers search franticly to find clues and solve puzzles to hopefully piece together all the elements they need to Breakout. Opening to the public on November 11th 2016 we launched with just our Vacancy room in which players raced to escape the room before the serial killer motel manager returns and you are his next victim, and our Wanted room, where you and your gang of Wild West outlaws break in to a Saloon in search of gold and your prized gun! Since our two rooms have launched we have been challenging all of Chester to escape the clutches of our puzzle rooms and attempt to Breakout.